Indestructible electronics are a step closer to reality thanks to engineers at the California Institute of Technology (Caltech), who have developed what they are calling “self-healing” integrated chips. The team from the High-Speed Integrated Circuits laboratory in Caltech's Division of Engineering and Applied Science repeatedly blasted tiny power amplifiers with a high-power laser, vaporizing many of their components, then watched the chips develop their own work-arounds in less than a second. 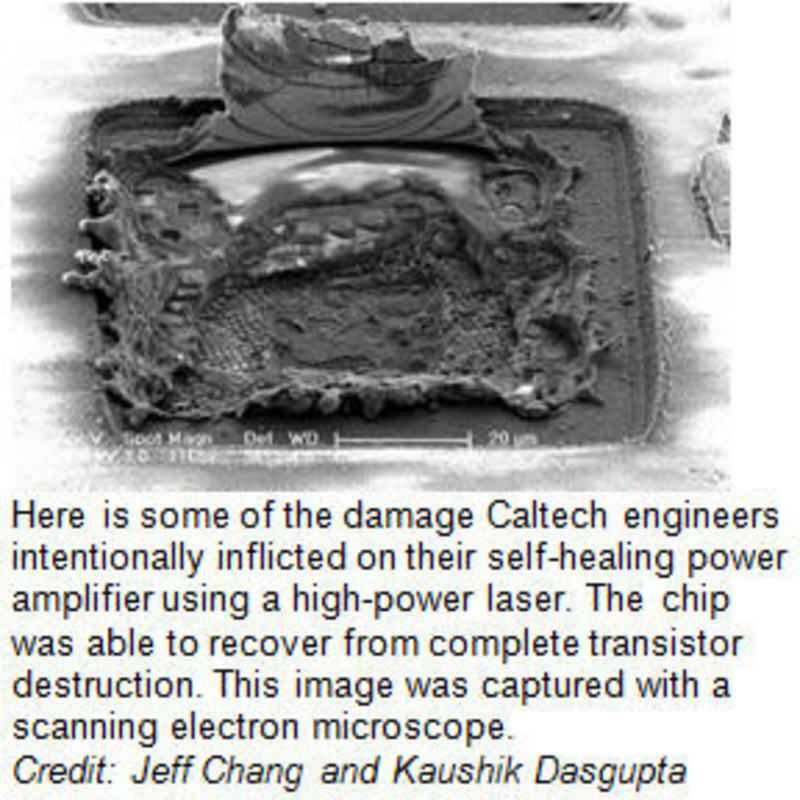 The chips are so small that 76 of them, including the amplifier and everything needed to heal it, can fit on one penny. The amplifiers developed by the team use on-chip sensors that monitor temperature, current, voltage, and power. These sensors send the information to a custom application-specific integrated circuit (ASIC), which is a central processor on the same chip that functions as the system’s "brain." The ASIC evaluates the information it receives from the sensors about the amplifier’s performance, decides what adjustments need to be made to the system’s actuators, and makes those changes. The unit was designed to get to the optimum state for all actuators in any situation without outside intervention. Funded by the Defense Advanced Research Projects Agency (DARPA) and the Air Force Research Laboratory (AFRL), the capability was demonstrated on a power amplifier for millimeter-wave frequencies. Since chips operating at these high frequencies are useful for next-generation communications, imaging, sensing, and radar applications, showing successful self-healing here should mean that it also can be done in less cutting-edge electronic systems. While the appropriateness of the term “self-healing” is open to debate — since it’s more of a work-around than an actual healing or even repair — the promise of this technology is indisputable. From fixing the smartphone you dropped on the floor at home to repairing battlefield damage to critical electronics, this advancement has the potential to save money and lives.